The sun was setting, transforming the sky into beautiful shades of muted yellow and blue, illuminating the beautiful temple in front of us. 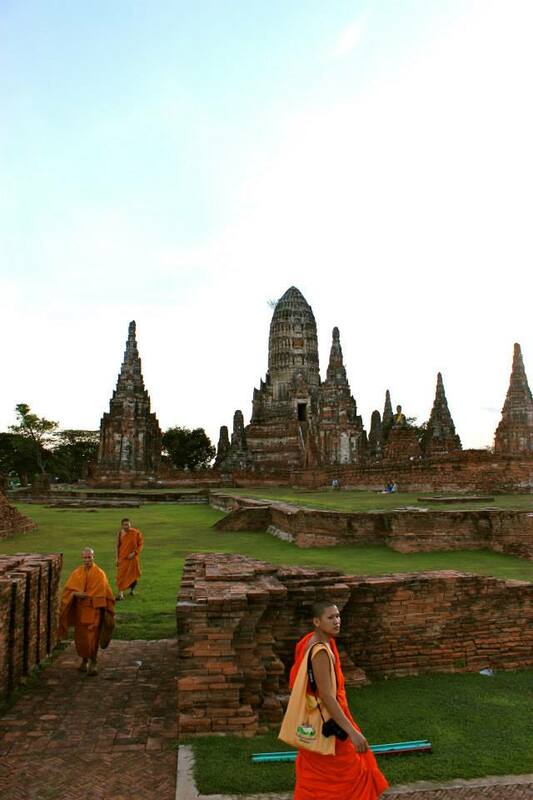 The monks, in there orange robes, walking around the grounds. It was picturesque, one of the most gorgeous places I’ve ever seen. We sat on the grass, with the river behind us, admiring this view, completely bewildered by the fact that there were only five others around to witness this sight too. 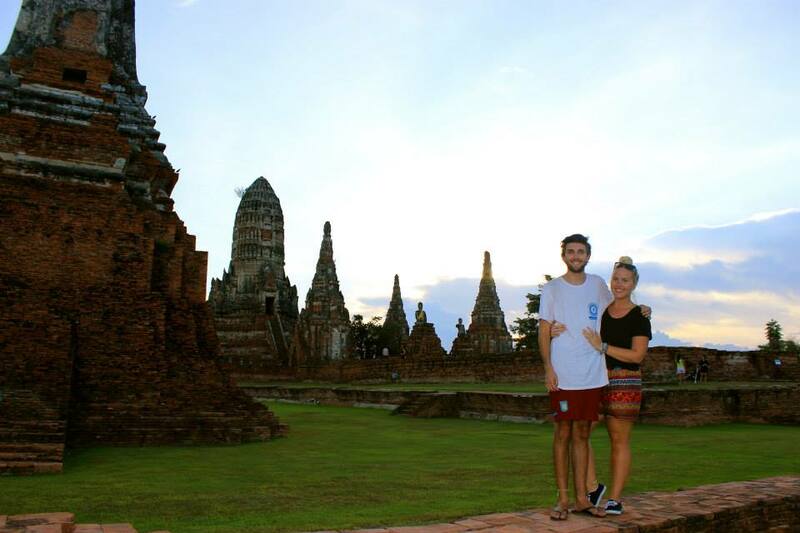 We’d heard and read that some of the best temples in Thailand were in a small little town North of Bangkok called Ayutthaya. Still in the first few weeks of our three-month journey through South East Asia we were yet to reach the point that we couldn’t even discuss temples we were so sick of seeing them and we were so excited to explore this town. We read on a few travel blogs that the best way to get there was by train. A particular blogger suggested that instead of going on first or second class, as the ticket master automatically tries to sell you, to ask for a third class seat. It was only 15 baht (50 cents) compared to the 250 baht ($7). They don’t have air conditioning but they wrote that once the train started moving the breeze through the windows cooled you down… I don’t know what the weather was like when that blogger made the journey but I’m telling you now there was no refreshing breeze on our journey. I could have run faster than this train… If I was fit enough, that is. To make the journey even more challenging the ticket master sold us a ‘standing’ ticket. Meaning we had no seat and we were expected to stand for the two-hour (which being Asia of course turned to a four-hour) journey. Luckily the locals pitied us a bit and would allow us to sit with them when their was space, resulting in us spending three hours playing musical chairs as sweat poured out of every pore on our bodies. At one point the lady sitting next to Andy grabbed his hand and put her sleeping child’s head in it. At first he was confused with what was happening and moved his hand, only to see the child’s head fall to the chair. Before the lady could notice what happened he quickly lifted the child’s head up and supported it again for a few minutes until the lady was finished rearranging her things. It was an interesting few hours to say the least, but that’s all part of traveling. At last we finally reached Ayutthaya. 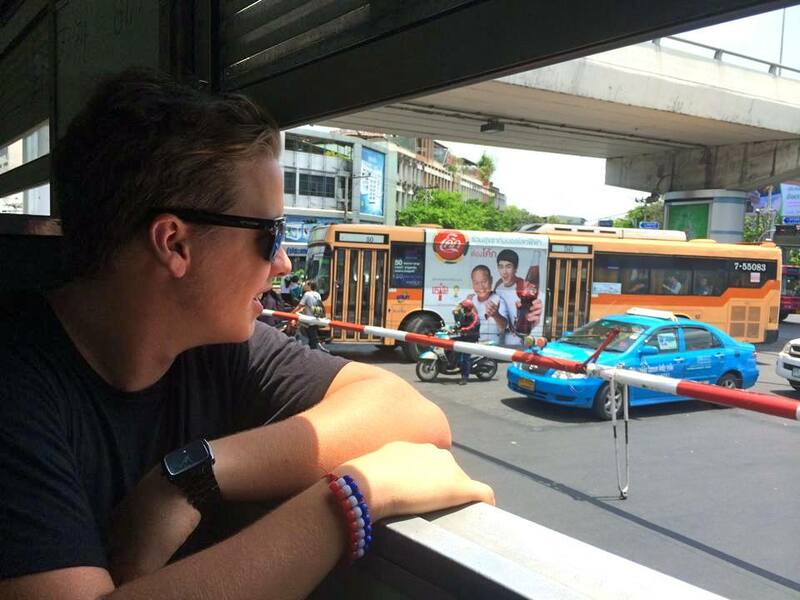 We stored our backpacks at the train station for 10 Baht each and made our way to the river. 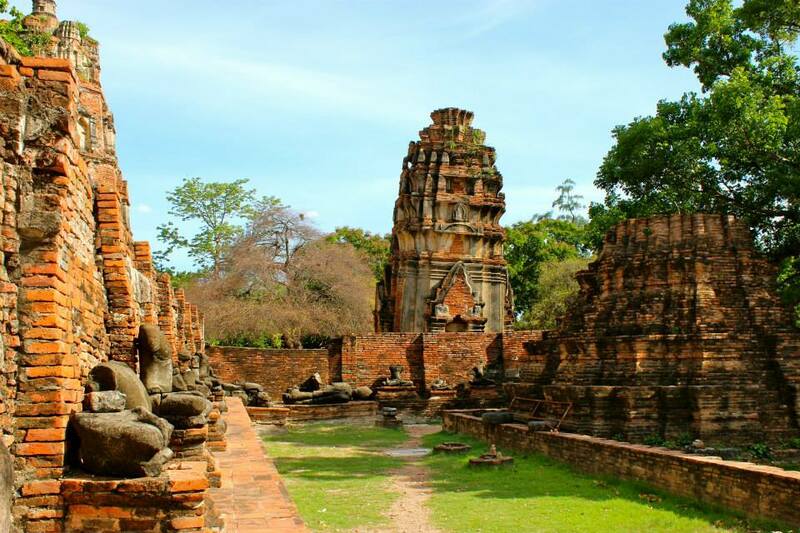 The Ayyuthaya Historical Park covers the ruins of the old city of Ayyuthaya, Thailand. 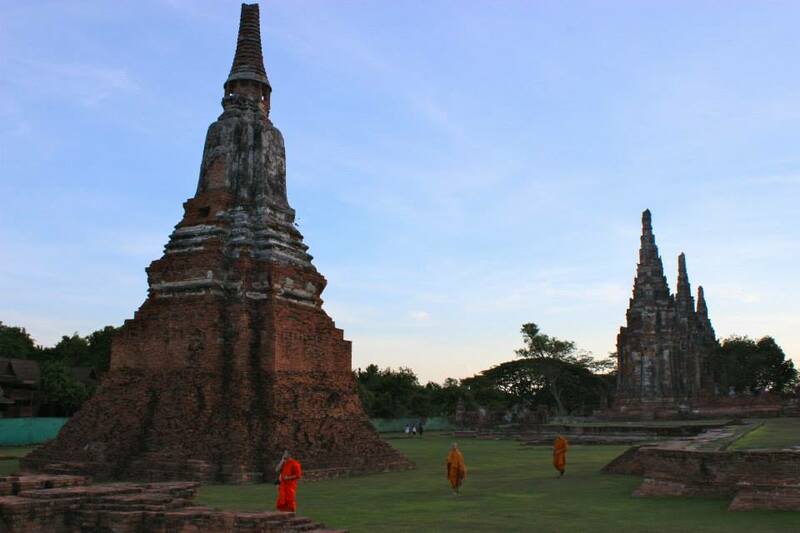 The city of Ayutthaya was founded by King Ramathibodi in 1350 and was the capital of the country for 400 years. Due to Thailand’s central location between China, India and Malaysia it was the ideal location for a trading and commerce centre in central Thailand. Trade turned the small island into the most powerful kingdom in the region. By 1700 Ayyuthaya had grown into one of the largest cities in the world with an estimated population of one million people, all living and trading within the kingdom. The volume and mass of trade coming through the city had attracted merchants from the world over, including China, Japan, India, Portugal, France, and the Netherlands. Many of whom were settling in the city and calling it home. 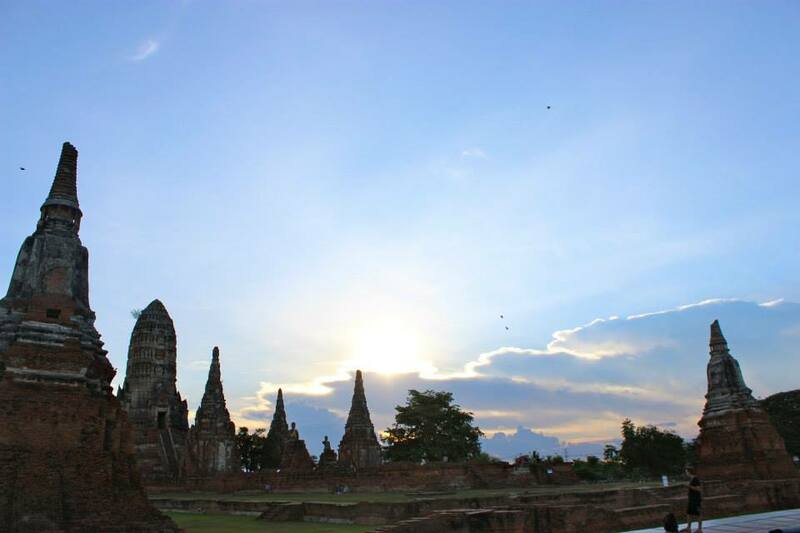 Upon seeing the golden temples and stone statues within the Royal Palace, many merchants from the west proclaimed Ayutthaya to be the most beautiful city in the world, even rivaling the great monuments and architecture of Rome and Venice. But as like all great cities during these times, terrible tragedy and jealousy caused it’s downfall. A continuous war had been fought between the kingdom of Ayutthaya and it’s main rival, the Kingdom of Burma of nearly 200 years. The war eventually took it’s toll on the city, and in 1767 the Burmese army invaded the island city of Ayutthaya for the final time, bringing 400 years of history and cultural tradition to a terrifying end, setting fire to the entire city and killing over 80% of it’s inhabitance. The renovations and repairs of the cities historical temples and Wats began in 1969 and became more serious after the historical park was declared a UNESCO world heritage site in 1981. It’s a beautiful and historic place to explore. First we crossed the narrow river (in the shortest boat ride ever) for 4 Baht to visit Wat Maha That. The most famous and photographed part of this temple is the Buddha head that’s entrapped in a tree that grew around it. It looks much bigger in the photos online then what it was in reality but it was interesting to see nonetheless. If it weren’t for the fact it was 40 degrees that day we may have appreciated it even more. Then on the suggestion of the very friendly lady selling the boat tickets (who spoke the best English out of anyone we met in Thailand) we decided to do a two-hour boat trip to some of the best temples. It cost 200 Baht, all the temples were free, the driver waited for us at each stop and brought us back in time to make our night train. Perfect! The first temple, Wat Panan Choeng, held one of the biggest sitting Buddha statues in Asia. The second temple wasn’t impressive enough to mention but the third, Wat Chai Watthanaram, was our absolute favourite in Thailand and possibly Asia. You could pay to go in but the wall was so low you could stand outside and still get glorious sunset photos of it for free. We unfortunately had to share this experience with an older French couple who both lacked English and common sense. We were all on a thin, unstable long-boat and they would constantly move around or stand up heavily making the whole boat almost capsize multiple times, which could have been funny had we not been carrying our day packs with our cameras, go pros, laptops, iPhones and passports inside. Essentially we were carrying bags with thousands of dollars of equipment and no matter how many times the boat driver told them to be careful they just wouldn’t listen. We then all asked if they’d sit at the back of the boat so we could get out first and in last at the stops so we wouldn’t be stuck in the unstable boat behind them but they refused. Needless to say we were all relieved when we arrived back at the pier with all our belongings safe and dry. This was a highlight of our whole trip. If you liked Angkor Wat or didn’t like Angkor Wat for the crowds or just have a desire to see beautiful places in the world then I suggest putting Ayutthaya on your list. It’s free, its beautiful and it’s un-crowded. We literally shared this place with five people. Perfection! Over to you. 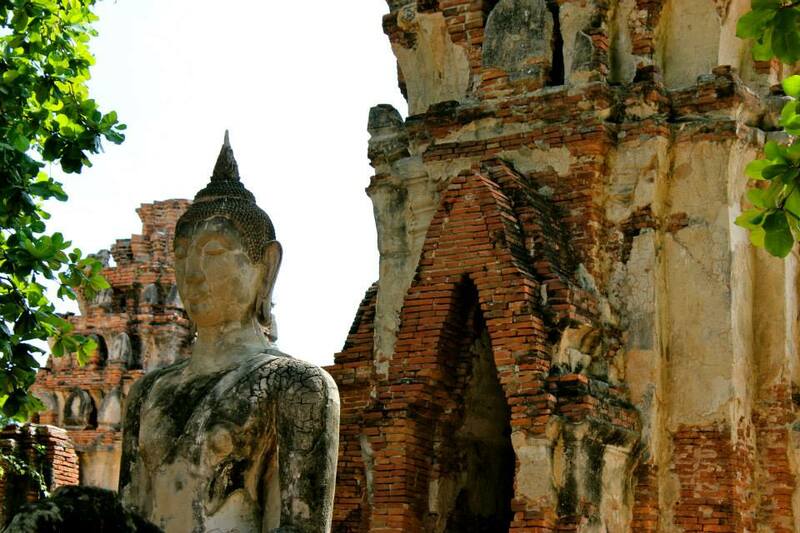 Have you visited Ayuthaya? If you haven’t is it somewhere you’d like to explore? Oooh I HATE when people don’t behave in little boats like that! Drives me nuts. Sounds like a lovely spot though – will keep it in mind! I know, right?! It really is so lovely. 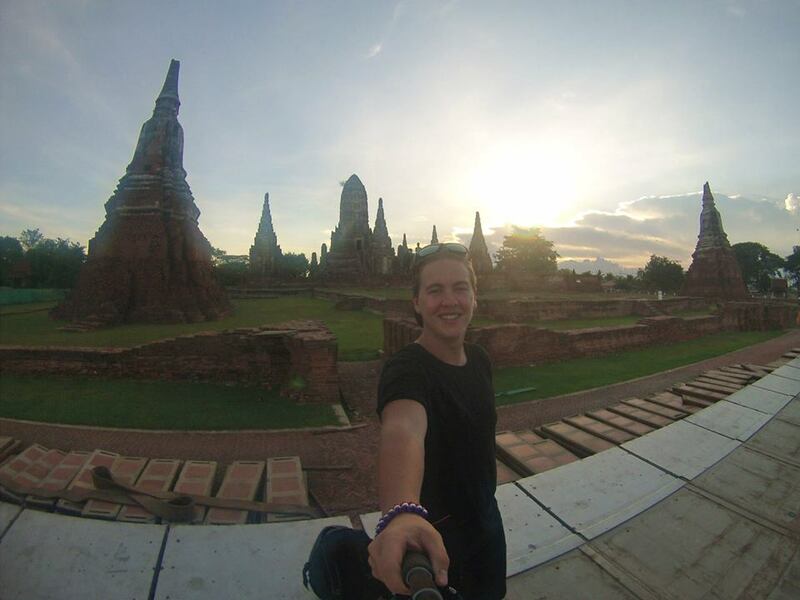 Have you guys done Thailand yet? You should put it on your lost if not!